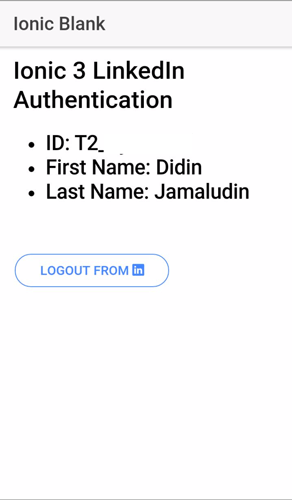 Step by step tutorial of LinkedIn authentication using Ionic 3, Angular 4 and Cordova. This step by step tutorial of LinkedIn authentication using Ionic 3, Angular 4 and Cordova will be started by setting up an app in Linkedin developer dashboard. After getting an app ID, as usual, we will start implementing from scratch by creating new Ionic 3 app. 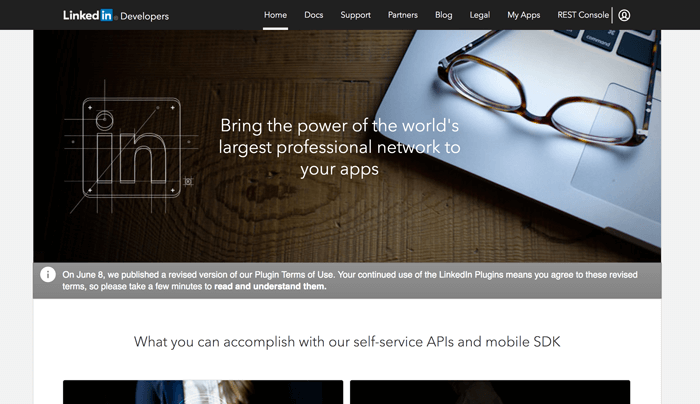 Open your browser then point to LinkedIn developer portal. Sign in using your linked account by click on person icon. Click My Apps menu then click 'Create Application' button. Fill the form, all fields with the asterisk should not left blank then click Submit button. Now, you can see client ID and client secret, write it to your notepad. You can check default application permission that will use in your Ionic 3 application. Add authorized redirect URLs, use this URL 'http://localhost/callback' then click update. Next, open the mobile menu on the left. 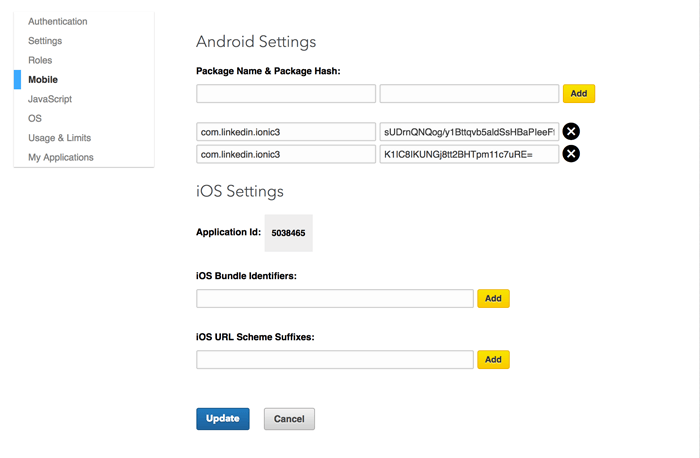 What you need to do is fill package name and package hash in Android setting section. For this tutorial, we use package name 'com.linkedin.ionic3' for the package that you need to generate it from current 'debug.keystore' for development or your 'release.keystore' for production. To do that, back to the terminal or cmd then type this command to get the SHA1 and SHA256 hash. You can find 'debug.keystore' in your Android SDK folder. Now, convert SHA1 and SHA256 to Base64. I'm using this online tools for it. After you get the base64 string that must paste to package hash column the click 'Add' button. As you can see in the picture above there is two package hash (SHA1 and SHA256) and one app package name. Before creating Ionic 3 and Angular 4 app, make sure your environment exists and updated to the newer version. Type this command for checking the versions. [INFO] The Ionic CLI has an update available (3.4.0 => 3.5.0)! Then we have to update the Ionic CLI to the latest version. We can update it together with Cordova. Next, create new Ionic 3, Angular 4 and Cordova app by type this command. 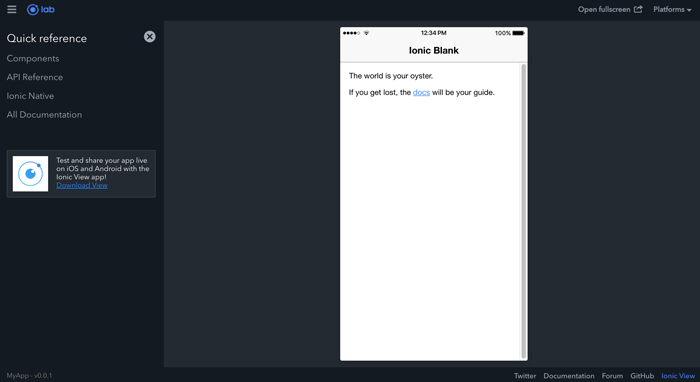 For now, choose 'n' because we will not use 'ionic.io' for now. Next, go to the newly created Ionic 3 project folder. Open and edit file 'config.xml' from the root of the project folder then change widget id same as previously setup in the LinkedIn app. Now, run the app on the browser by type this command. The default browser will automatically open and it looks like this. Stop the running Ionic app hold control key together with c (ctrl+c). Now, we have to install Ionic 3 Cordova Native Linkedin plugin. You can check that plugin is supported by Ionic Framework and Cordova at Ionic Native Docs. In the terminal or command line type this command. Which 'YOUR_APP_ID' is the client ID of your Linkedin app that previously written after Linkedin setup. Then install the module by type this command. Next, open the file 'src/app/app.module.ts' then add this import. Also, add to providers section in '@NgModule'. So it will look like this. That is the basic setup for the plugin. Next, we will cover all feature or function in the plugin. We will create Linkedin login by add 'login with LinkedIn' button the current home page. Started with the controller, open and edit the file 'src/pages/home/home.ts' then add this import. Also, inject LinkedIn module to the constructor. Add variable below of class name. Add new login function for login to LinkedIn. Now, we have to create a button for login to LinkedIn. Open and edit file 'src/pages/home/home.html' then add this HTML tags. This time we have to run the app to make sure all configuration working properly. Using this plugin only working with the real device, so in the terminal or cmd run this command. Before it, make sure your device is connected to your computer. 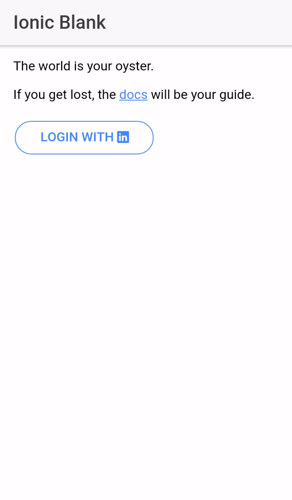 Tap on Login with 'in' button. If it's working, it should open LinkedIn the app to get confirmation. Otherwise, this error will be shown on the chrome inspector. "errorMessage": "either bundle id or package name \/ hash are invalid, unknown, malformed"
Tap 'OK' button from the LinkedIn app that open. If the login is a success, you will see in the Chrome inspector console the message 'Logged in!'. That's mean, our configuration is working. To check if we the login is active or session is active, open and edit again 'home.ts' then add this variable below the previous variable. Then add function for checking active session inside 'ionViewDidAppear' built in Ionic 3 method (Add this method if doesn't exist). Also, we have to add logout function. Edit function login and make it like this. Next, edit again 'home.html' and replace all body content to be like this. Now, run again on the device and see the difference. This plugin has a function to get ID, First Name and Last Name from LinkedIn of the current logged in user. Open and edit 'home.ts' the add this variable for holding data. Create a new function to get data. Call that function on 'ionViewDidAppear' and 'login' function, so it will called after current user logged in. Now, we will display ID, first name and last name in the view. Edit 'home.html' then add this lines after 'isLoggedIn' if clause. Run again the app on the device, then see what happens after login successfully. It should be like this. Another plugin function is post something to currently logged in user LinkedIn profile. We can test it using below function, edit 'home.ts' then add this function. Add a share button to the view before log out button. So, the complete content of the view should be like this. Re-run again and click the share button. That it's for now, you see full source code on our GitHub.